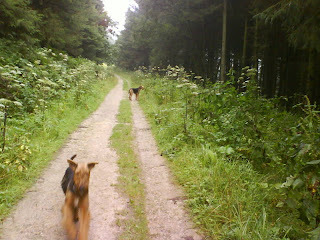 We’re on holiday & I’m starting to walk them again. I’m a bit slow & can’t yet do the 4 miles that I normally do but I managed 2 this morning. I think the fact that I’ve lost nearly 4 stone in the past 11 months & am a lot fitter than I used to be has helped a lot. Thanks for all the emails, texts & comments. I’m knitting again & have two new wip’s but more on those soon…..
>I am glad you are back in the fresh air, take care! >So glad you’re feeling up to walking the dogs and life again. Just take it easy and keep looking after yourself. And what a fantastic achievement with your weight loss!